For Prelims: Key facts about the project. For Mains: Issues associated and the way ahead. Context: Andhra Pradesh government has launched works for erection of the first radial gate – the 41st one – at the Polavaram project site. The state hopes that the project works would be completed by May 2019 and water would be released to canals under gravity by December 2019. 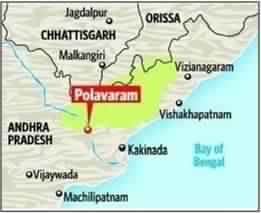 The Polavaram project was accorded national status in 2014 in the Andhra Pradesh Bifurcation Act and its design was changed.